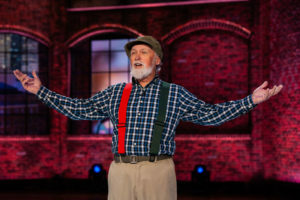 Steve Smith as Red Green. The Canadian comedian known globally for his role as the quirky handyman “Red Green” is planning to visit five Iowa cities for performances this month. Audio: Matt Kelley’s interview with Steve Smith. 6:00. Steve Smith, who created the character and the TV program that ran for 15 seasons, says his one-man show isn’t a stand-up act, but follows the familiar antics of members of the fictional Possum Lodge in the deep woods of northwestern Ontario. This U.S. tour has 35 dates scheduled and promoters say 11 are already sold out. Smith will play the Adler Theatre in Davenport on Saturday (April 13th), Hoyt Sherman Place in Des Moines on Sunday the 14th, Five Flags Center in Dubuque on the 15th, the Bridge View Center in Ottumwa on the 16th, and Stevens Auditorium in Ames on the 17th.